A better question may be, who is he not? Turrell is a psychologist and an astronomer; a pilot and a rancher; an expert on mathematics and religion; a “Macarthur Genius” and it seems, all around mental giant. The breadth of his knowledge is mind-boggling. 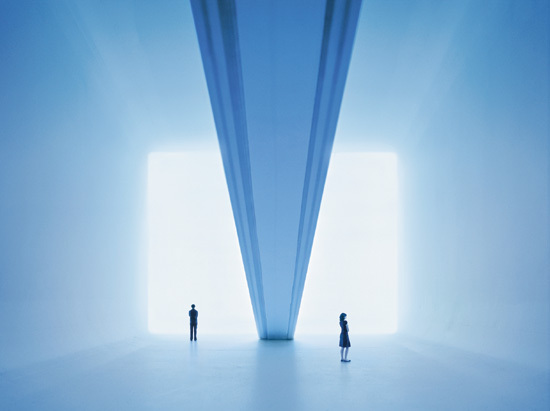 Upon earning a degree in perceptual psychology from Pomona College and masters in art from Claremont Graduate School, Turrell combined his interests to create art that altered his viewers’ perceptual experience. 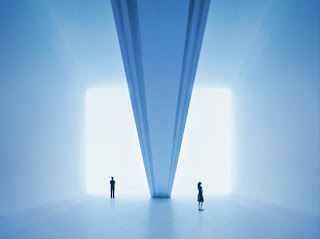 By using light as a medium, Turrell crafted installations that change the way we see, think, and feel — he is a kind of sensory magician with the power to modify the very ways in which we encounter the world around us. Often his work calls to mind the mesmerizing affects of everyday light phenomena such as a smoldering desert sunset, the sublime twinkling of the night sky, or the artificial glow of your living room television set. He is perhaps most famous for his Roden Crater — a bafflingly large and remote desert crater that opens its volcanic eye to the Arizona night sky; making astronomic happenings, rather than human creation, the principal feature of his work. What is Light and Space art anyway? To experience a piece of “light and space art” is to arrive at a sensory revelation. The vehicle that takes you there is your own perception of light. Enter an “installation” defined by intangible atmospheric elements of light and space, rather than art objects such as sculpture or painting, and you may find your familiar world turned on its head; so flipped and skewed it becomes entirely unrecognizable as its former self. Your eyes will deceive you, your emotions betray you, and your grasp on physical space escape you. Think adult fun house — except this time the fundamental questions of human perception take center stage. "Light is a powerful substance. We have a primal connection to it. I like to work with it so that you feel it physically, so you feel the presence of light inhabiting a space... I wanted to employ sunlight, moonlight and starlight to empower a work of art”. What can I expect from Jame's Turrell's Trace Elements?